Regional cooperation to be conducted under Article 13 of the Marine Strategy Framework Directive (MSFD). As a Party to the Convention on Biological Diversity, the European Union must encourage Member States to achieve the objective of creating 10% of Marine Protected Areas by 2020 established by the decisions of the Nagoya Conference in October 2010 (CBD COP 10 – Aichi Target 11). The OSPAR Convention is the current legal instrument guiding international cooperation on the protection of the marine environment of the North-East Atlantic. Work under the Convention is managed by the OSPAR Commission, made up of representatives of the Governments of the 15 Contracting Parties and the European Commission representing the European Union. OSPAR has developed and implements a set of five thematic strategies to address the main threats it has identified within its competence: biodiversity and ecosystems, eutrophication, hazardous substances, the offshore oil and gas industry, and radioactive substances. One of the four components of the OSPAR Commission’s “Biological diversity and ecosystems” strategy relates to the development of a network of MPAs. OSPAR defines "Marine Protected Areas” as an ecologically coherent network of well-managed Marine Protected Areas. This designation relies on sites already designated nationally in waters under domestic jurisdiction. Partly resulting from exchanges held within OSPAR, MAIA works in close connection with the executive secretariat, namely within the framework of activities of the Intersessional Correspondence Group on Marine Protected Areas (ICG_MPA). MAIA ensure that its works is in line with the Convention, while also seeking to pass on to MPA managers the OSPAR recommendations and guidelines relatives to MPAs. The executive secretariat of OSPAR pays particular attention to work done within the framework of MAIA on compliling and analysing data relative to MPA management. The objectives of the Marine Strategy Framework Directive (MSFD) require achieving or maintaining good ecological status of the marine environment by 2020. The Directive results from the European Commission's Marine Strategy proposal, contained in a blue paper approved by the European Council on 14 December 2007 which aims to promote an integrated marine policy for the European Union (Marine Strategy Framework Directive no. 2008/56/EC of the European Parliament and the Council of 17 June 2008). European Union Member States are required to take all necessary measures to reduce the impacts of activities on the marine environment. This environmental directive develops an ecosystem approach to the marine environment, in connection with other European directives (Natura 2000, Water Framework Directive, etc. ): it aims to maintain or restore the functioning of marine ecosystems (conservation of biodiversity, interactions between species and habitats, dynamic and productive oceans), while safeguarding uses of the sea by future generations, on a sustainable basis. MAIA contributes to certain European objectives in terms of regional cooperation pursuant to Article 13 of the Marine Strategy Framework Directive (MSFD). the conservation of wild birds. Special Protected Areas (SPA) for threatened and migratory bird species. Natura 2000 areas comprising a maritime part are considered marine protected areas. 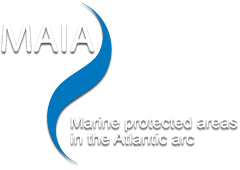 This international designation is common to all countries in the Atlantic Arc, so these marine sites thus make an important contribution to the MPA network. Council Directive 92/43/EEC of 21 May 1992 concerning the conservation of natural habitats and of wild fauna and flora. This directive, also referred to as the “Habitats” Directive, aims to contribute to protecting biodiversity in Member States by defining a common framework for the conservation of habitats, plants and animals of community interest. The “Habitats” directive establishes the Natura 2000 network comprising special conservation areas designated by the Member States under the directive. Moreover, it also includes special protection areas established under the “Birds” directive 2009/14/EC. Directive 2009/147/EC of the European Parliament and of the Council of 30 November 2009 on the conservation of wild birds (this is the codified version of Directive 79/409/EEC as amended) is the EU's oldest piece of nature legislation and one of the most important, creating a comprehensive scheme of protection for all wild bird species naturally occurring in the Union. The directive recognizes that habitat loss and degradation are the most serious threats to the conservation of wild birds. It therefore places great emphasis on the protection of habitats for endangered as well as migratory species (listed in Annex I), especially through the establishment of a coherent network of Special Protection Areas (SPAs) comprising all the most suitable territories for these species. Since 1994 all SPAs form an integral part of the NATURA 2000 ecological network. Je viens de consulter cette page, http://www.maia-network.org/homepage/marine_protected_areas/intitutional_framework, je te la conseille.